Elle rents out her spectacular clifftop house on Airbnb while she travels to France to guest-speak on a writing retreat. Upon returning home she has a strange feeling something's not quite right but can't put her finger on it - the house feels different and she begins to imagine someone's watching her. I've read lots of psychological thrillers this year - some good and some, well, not so good. You Let Me In was great and it's put author Lucy Clarke on my radar. The plot was impressive and didn't give much away until the very end. I love it when a book has a killer twist in the closing chapters and that's exactly what this had. It maintained a suspenseful atmosphere throughout and occasionally chilled me to core. The thought of a stranger invading your home and leaving discreet 'evidence' of their presence is not a pleasant one. It was fabulous edge-of-the-seat stuff! The story is told from the perspectives of Elle and the person watching her. There are flashbacks to Elle's younger years and her time at university. It's an often-used formula but one that I personally believe works well. 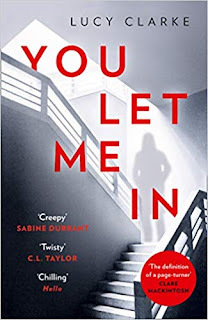 It was very enjoyable and I wouldn't hesitate in recommending it to anyone who loves a chilling psychological thriller. My thanks to Lucy Clarke, HarperCollins and NetGalley for providing a review copy of this book. Lucy Clarke is the bestselling author of five psychological thrillers - THE SEA SISTERS, A SINGLE BREATH, THE BLUE/NO ESCAPE, LAST SEEN and YOU LET ME IN. Her debut novel was a Richard and Judy Book Club pick, and her books have been translated into 12 languages. Lucy is a passionate traveller and fresh air enthusiast. She's married to a professional windsurfer and, together with their two young children, they spend their winters travelling and their summers at home on the south coast of England. Lucy writes from a beach hut.